Ask Santa Claus a question and have it answered on the Santa Daily podcast! Well, even though he’s very busy, Santa’s agreed to answer a few questions from special Fun Kids listeners who’ve been really good this year! 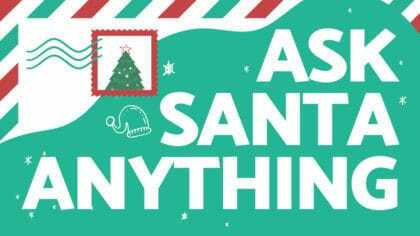 Your questions might be featured on Santa’s very own podcast, The Santa Daily! If you’d like to speak to Santa, just get a grown-up to fill in the short form below. You never know – Father Christmas could be answering your question at some point – and if he does, you might hear yourself on the podcast! Please note: Santa is very busy and unfortunately cannot respond to every request.